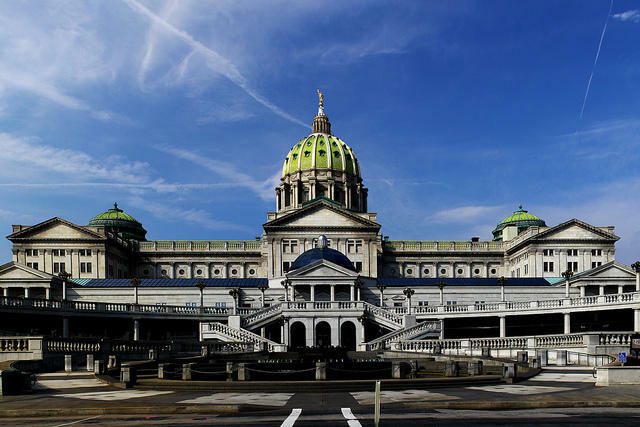 HARRISBURG (WSKG) — After a tumultuous budget process that saw state lawmakers pass a plan they couldn’t fully pay for, many are looking into changing how the system works entirely. For four months, the budget was in a sort of limbo. A $32 billion spending package passed just after the June 30th due date, so most state spending continued as usual. But the budget was over $2 billion out of balance, and stayed that way until late last month. “It has to be one vote so we don’t spend money we don’t have, and frankly so politicians don’t get to say, ‘I want to spend this money, which is popular, but I’m not going to vote to pay for it because that’s unpopular,'” Montgomery County Senator Daylin Leach said. Leach, a Democrat, said he’s putting together a measure that would require the spending and funding portions of the budget to pass together as a single bill. Matt Brouillette, Republican president of the advocacy group Commonwealth Partners Chamber of Entrepreneurs, is taking a different route. He’s suing the state, arguing lawmakers violated the constitution by passing an unbalanced budget. He’s also trying to keep the state Treasurer and Auditor General from authorizing loans while the commonwealth’s budget isn’t balanced–something Treasurer Joe Torsella, a Democrat, did to an extent during the impasse. Governor Tom Wolf maintains it is constitutional to allow spending plans to become law without the revenue to fully pay for them. Yet another reform measure actually passed along with this year’s revenue plan; a bill to create “Performance-Based Budgeting” will require creation of an independent board comprised of the state budget secretary and chairs of both chambers’ Appropriations committees. Their job will be to review so-called performance-based budget plans put together by the Independent Fiscal Office. The plans are intended to be used by the legislature and governor.